I'm a firm believer that homemade baked goods say more than almost any other gift. It's sort of selfish, really. It's so much fun for me to bake for other people, that it hardly feels like I'm doing it in an act of generosity. But usually it winds up being a win/win situation since the recipient tends to appreciate those efforts too (no shocker there!). I wanted to bake to thank some friends for a favor recently (hi V & L!) and these cookies instantly came to mind. The cookies actually share some qualities with these friends of ours: uncomplicated, just the right balance of crunchy and sweet, and one part Mexican too! They were the perfect project for a weekend afternoon. The cinnamon and black pepper are the perfect compliment to the chocolate flavor and the light, crispy texture of the shortbread. All in all, a successful project! 1. Sift the flour, cocoa, cinnamon, pepper, and salt together twice onto a piece of waxed paper. In a medium bowl, cream together the butter and sugar until light and fluffy. Mix in the vanilla, then stir in the flour mixture. Stir and knead the dough (it will be dry and crumbly at first) until it is moist, dark and supple. Between 2 sheets of waxed paper, roll the dough 1/4-inch thick as evenly as possible. Chill for 30 minutes. 2. Position a rack in the middle of the oven and preheat the oven to 275˚F. Line 2 baking sheets with parchment paper or Silpat. 3. 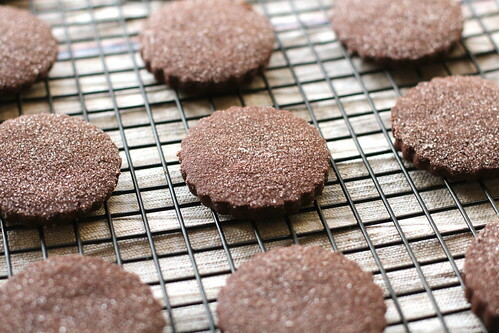 Cut out the cookies with a 2-inch round cutter. Spread the coating sugar on a plate. Lightly press the top of each cookie in the sugar, so that the sugar clings to the dough. Arrange the cookies, sugar side up, on the prepared sheets, spacing them well apart. 4. Bake 40 to 45 minutes, until crisp and firm. Transfer cookies carefully to a cooling rack to cool completely. Repeat with any remaining dough.